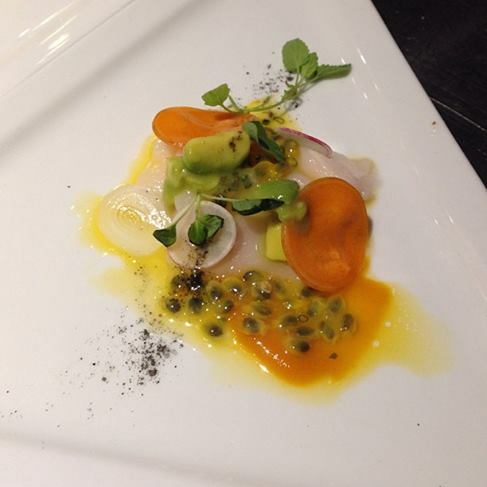 Crudo de Escolar by Aaron Sanchez at ¡Latin Food Fest! Sometimes we in San Diego find it tough to think outside the taco. Mexican food is all around us. We’re proud of our fish tacos, burritos and carne asada fries. Leaving aside the question of whether some of those even are Mexican food, the Latin food world is bigger than that. In fact, it’s bigger than Mexican cuisine. And that’s the world that ¡Latin Food Fest! celebrates. Pulpo on the grill at ¡Latin Food Fest! Latin cuisine, in fact, is bigger than Latin America. It is nothing less than the food of Spain and Portugal and their respective former colonies in the Americas. From the Rio Grande in the North to the tip of Tierra del Fuego in South and including Caribbean island lands such as Cuba, Puerto Rico and the Dominican Republic the food, drinks and culture are as varied as the geography they encompass. 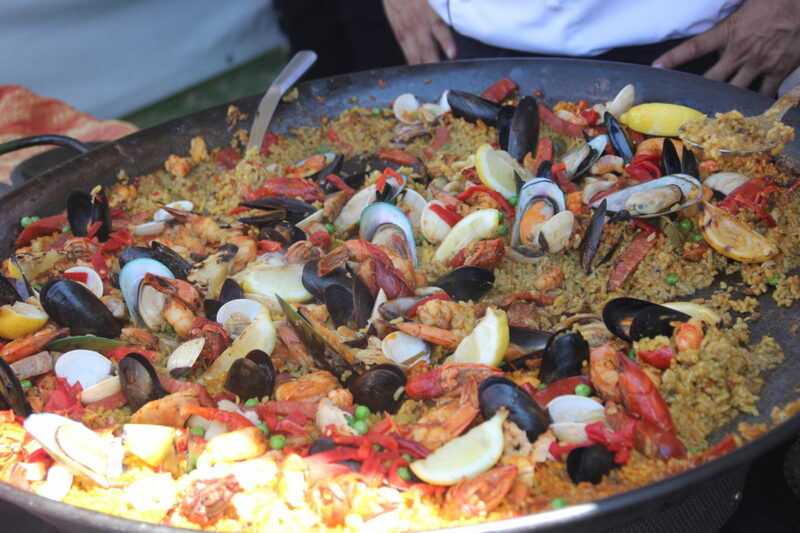 Paella by Café Sevilla at ¡Latin Food Fest! Latin cuisine is incredibly diverse. It ranges from Spain’s paella to Argentine parrillada with chimichurri, Peruvian ceviches and tiraditos, Cubano sandwiches, the seven great regional cuisines of Mexico and plenty in between. Frankly, about the only things that tie them all together is the fact they are all Latin and they are all incredibly flavorful. 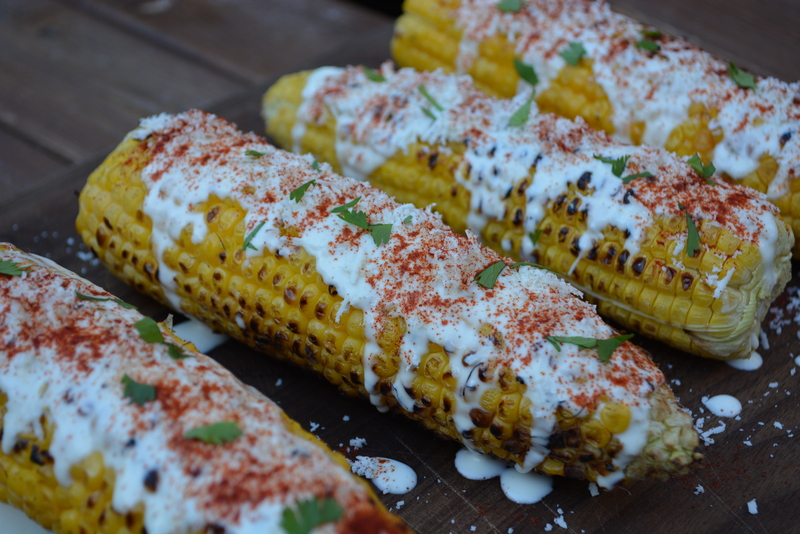 Elotes by Martin San Roman at ¡Latin Food Fest! As diverse as Latin cuisine is, there are some commonalities. Many of the cuisines of Latin America include crucial components based on maize, corn that tends to be other than the sweet corn so familiar to American eaters (though elotes are an everyday Mexican street food). Amongst these are Mexico’s tortillas and tamales, Salvadorian pupusas, and the arepas of Colombia and Venezuela. 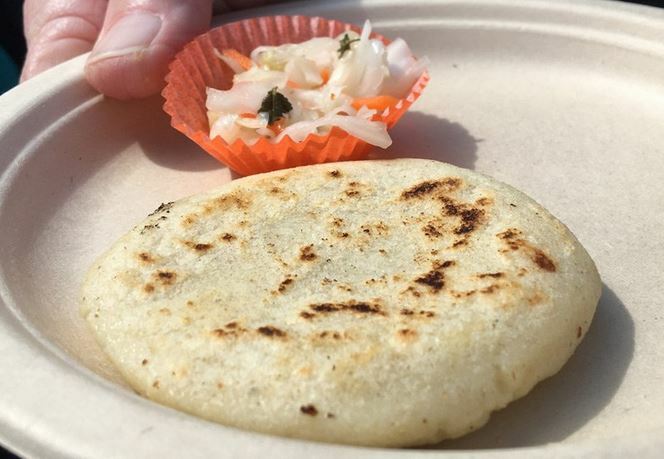 Pupusas by Los Molcajetes at ¡Latin Food Fest! Salsas and similar condiments are another commonality. Mexican salsas (like salsa fresca, aka salsa bandera or pico de gallo) are frequent, of course, though they bear relatively little resemblance to and has never relinquished that title. Guacamole is also nearly ubiquitous (but is generally only served with chips here or in Mexico’s northern reaches). And its not just Mexico: Argentina has its chimichurri, Peru has its aji Amarillo, Ecuador its aji criollo and Cuba its mojo sauce. 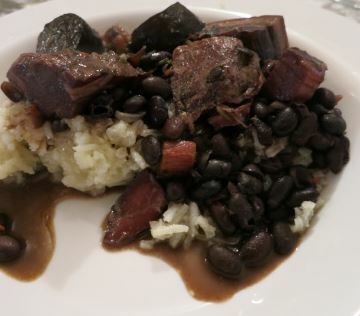 Feijoada by Abu’s Kitchen at ¡Latin Food Fest! We tend to associate beans with Mexican food. But beans are another staple of many Latin cuisines. From Brazil’s national dish, feijoada, to the classic garbanzo bean and pork based stew of Spain, cocido Madrileño, there are few Latin countries that do not pride themselves on what they do with this legume. 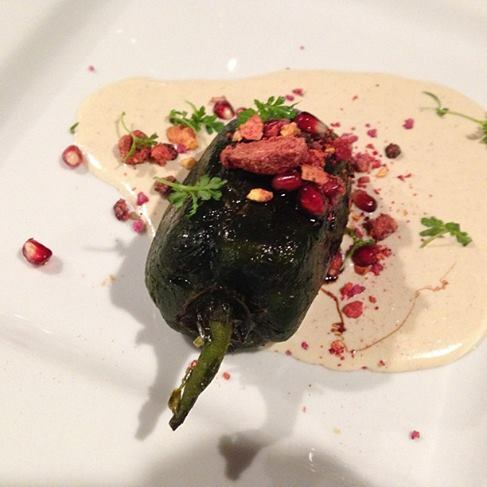 Chile en Nogada by Javier Placencia at ¡Latin Food Fest! Chiles also feature widely in Latin cuisine. From the many chiles that feature in Mexican cuisine (fresh such as jalapeño, serrano, poblano or habanero, dried like guajillo or pasilla or smoked like chipotle) to South America’s ajis or Spain’s padrons, where Latin food is to be found so, generally, are chiles. But the formula that CHILE = HEAT is oversimplified at best and dead wrong at worst. Indeed, the idea that chiles in Mexican food mean incendiary levels of spice is a misconception too. Chiles, whether in Spain or Mexico are more often used for the non-spicy aspects of their flavor profile than for their heat. It is from within the tremendous variety of those flavors – sweet, spicy, bitter and more – that the wonders of Latin cuisine can be found. Cracking Cocos at ¡Latin Food Fest! The ¡Latin Food Fest! 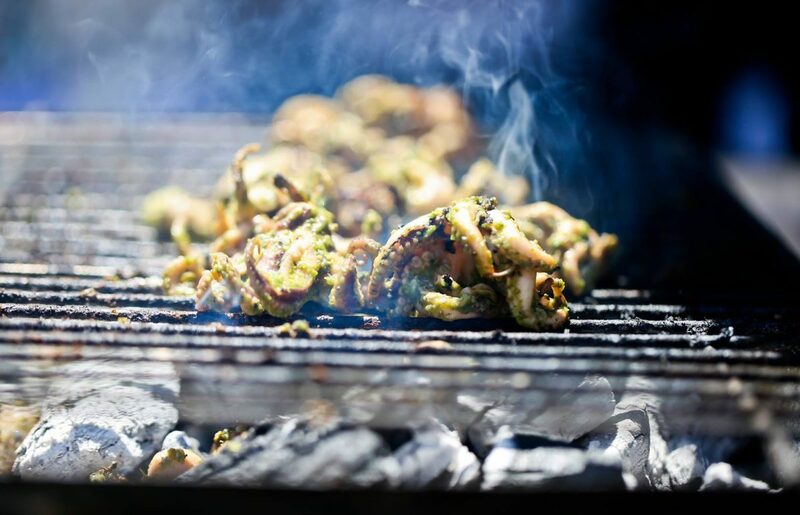 on August 18-19 at San Diego’s Embarcadero is a wonderful opportunity to taste many of the commonalities amongst Latin cuisines as well as discover its diversity. One of the reasons it is difficult for many of us to recognize how far outside the taco Latin cuisine really goes is because we rarely have the opportunity to experience these foods side-by-side. At the Fest’s Gran Tasting, Latin Superclub and Sunday evening Mercado, talented chefs – ranging from local luminaries to A-list celebrities — will be making and offering dishes representing the breadth and depth Latin cuisine has to offer. 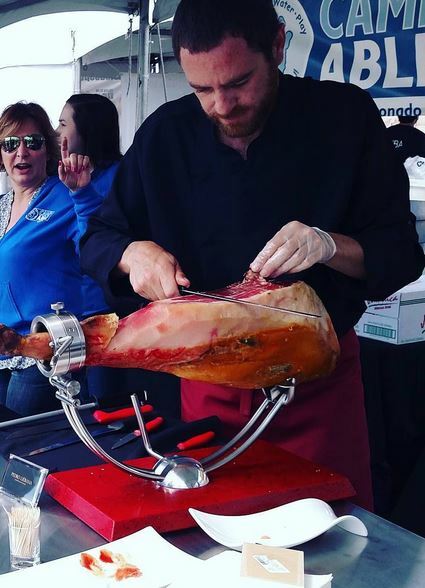 Jamon Iberico by Master Carver Pedro Liebana at ¡Latin Food Fest! Amongst the previous chefs at ¡Latin Food Fest! were Double Michelin star winner Josiah Citrin, The Food Network’s Aaron Sanchez, owner of forty restaurants worldwide Richard Sandoval, The Food Network’s Ingrid Hoffmann, Univision’s Tati Polo, and Mexican restauranteur Javier Plascencia to name several, Past standout dishes include the Goat Yora by two Caribbean chefs (Martin Omar who travelled from the Dominican Republic for the event and Chef Felipe Raul from Puerto Rico by way of Baja California), , Sous vide beef tongue and oxtail with charred chile by Javier Plascencia, Duck flautas with guajillo cotija sauce by Aaron Sanchez, Alejandra Schrader’s spicy arepas, Café Secret’s Peruvian cebiche, and Chef Sara Polczynski’s Three Chile Lamb Barbacoa. Pisco Porton at ¡Latin Food Fest! Another of last year’s highlights was the pairing of chapulines (grasshoppers) with Fortaleza Tequila! ¡Latin Food Fest! is not just about the food. 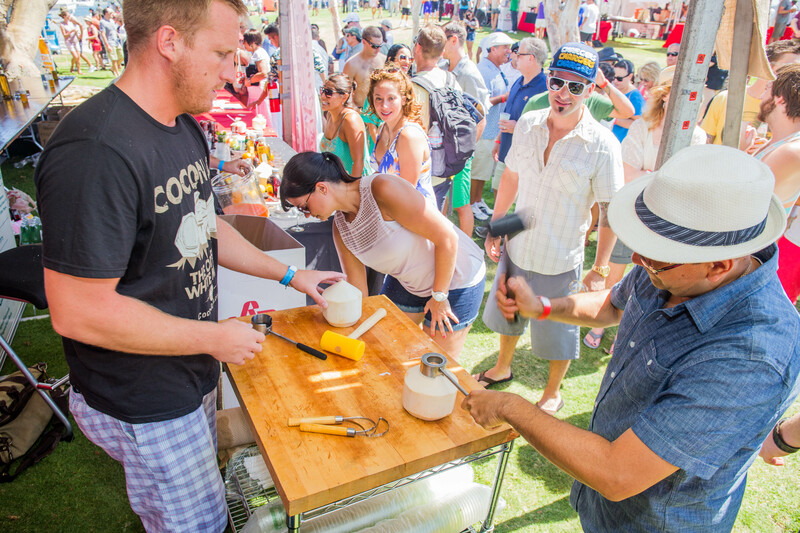 In addition to the tastings and the cooking demonstrations it sports robust spirits offerings under one tent (pisco, cachaca, rum, sotol, bacanora, raicilla, tequila and mezcal) as well as wine from Argentina, Chile, Napa, San Diego and Spain. 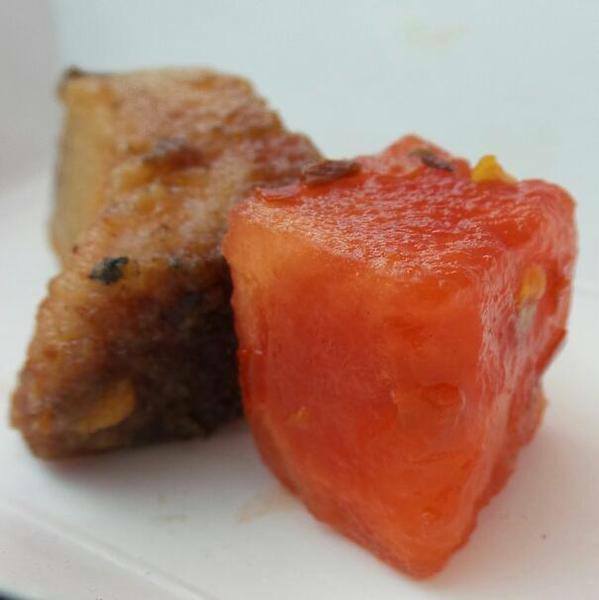 Pork belly and spiced watermelon at ¡Latin Food Fest! But that may be just what it takes to truly get outside the taco: food, wine, spirits and the full panoply of Latin culinary culture on display. Americas, Argentina, Baja, BajaMed/New Cuisine of Baja, Brazil, By Region, Carribean, Comfort Food, Culinary History, Fine Dining, Fusion, History, Styles, Etc., Mexico, News, North America, Peru, Peru, Slow Food, South American, Spain, Street Food, USA Aaron Sanchez, aji amarilla, aji criollo, arepas, Argentina, Caribbean, ceviche, chiles, chimichurri, cocido Madrilleno, Cuba, Dominican Republic, feijjoada, Felipe Raul, Gran Tasting, Javier Plascencia, Josiah Citrin, maize, Martin Omar, Mojo, Paella, parrillada, Portugal, Puerto Rico, pupusas, Richard Sandoval, salsa fresca, South America, Spain, tamales, tiraditos, ¡Latin Food Fest!